Enjoy $10.00 OFF Purchase of $50.00 or more with Coupon. Redeem Online with code "BRG10!". Restrictions may apply. Must present coupon. The Track Family Fun Parks in Pigeon Forge Features fun for the whole family with multiple go-kart tracks, blaster boats, Kids Country rides, an arcade and much more! The Track: Pigeon Forge – A family fun adventure! 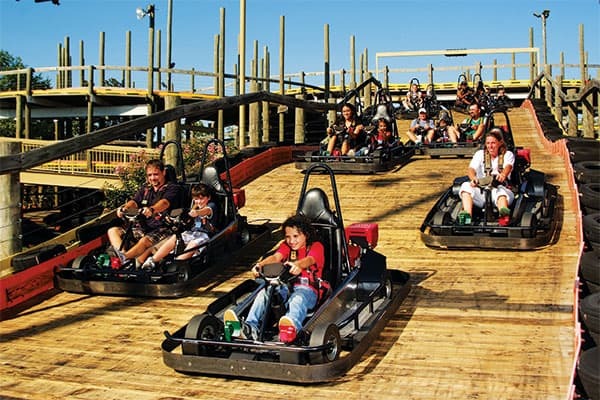 The Track Family Fun Parks in Pigeon Forge, TN feature fun for the whole family with multiple go-kart tracks, blaster boats, Kids Country rides, an arcade, and more. The Track’s signature attraction is the elevated, multi-level Wild Woody go-kart track, where drivers race up three and a half stories and then circle back down with an exciting drop at the bottom. The whole family can enjoy racing on the Family Track, Kiddie Karts and Rookie Track as well. Be sure to take a spin on the Blaster Boats for serious fun on the water or try to escape bump-free on the Bumper Cars. Challenge each other to a round of Miniature Golf to see who can get the first hole in one. Children love riding rides in Kids Country – a special place designed just for them. Enjoy rides such as the Carousel, Ferris Wheel, Planes, Spin Tops, Train, Swings and more. Visit The Track’s signature arcade – Fat Daddy’s Arcade – to enjoy countless games and incredible prizes. Enjoy interactive games like The Walking Dead, Jurassic Park and Fruit Ninja, or test your skills at Monster Drop Chaos, The Wizard of Oz, Skee Ball, Hoops and more. There are two convenient locations for The Track in Pigeon Forge – one near The Island and one near Dolly Parton’s Stampede. Rides vary depending on the park. For more information on each location, visit www.funatthetrack.com.